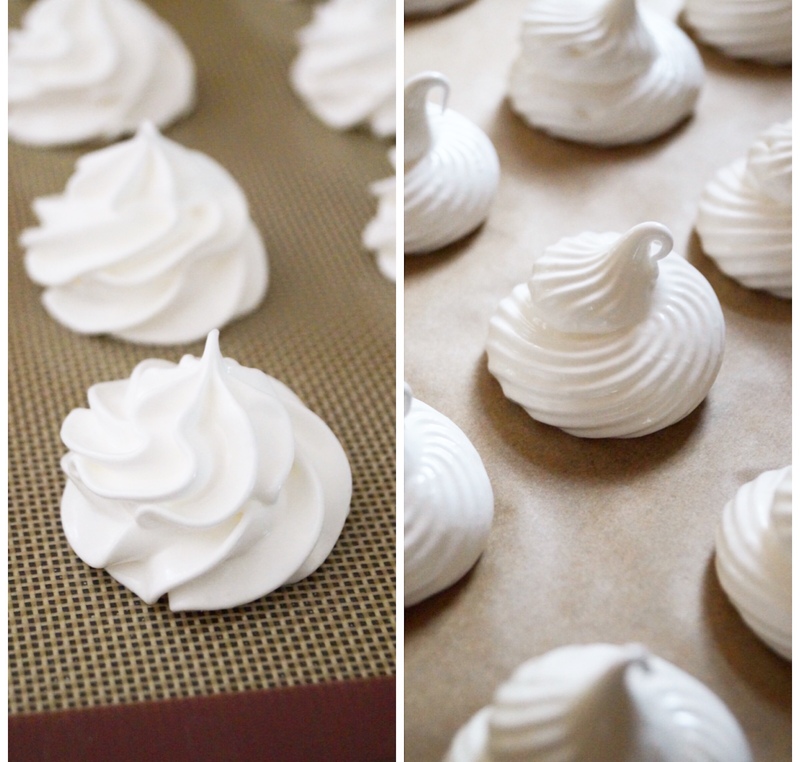 An easy recipe for perfect, crisp and fluffy meringues. I’ve been thinking about sharing a meringue recipe on the blog for so long now. Meringue is brilliant to master and this recipe would be great to have in your baking repertoire. Meringue seems like a very hard thing to make. There are a few things that can go wrong, but they’re honestly very easy to make if you follow this simple recipe and easy tips. These meringue are the ultimate treat, I really love crumbling them into Eton mess, piped over lemon meringue pie or even scattered over my Eton Mess Cheesecake. They’re much lighter than a regular dessert and make a delicious addition to an afternoon tea spread. Just thinking about munching on a crunchy sweet meringue is my idea of bliss! Before I started food blogging, I used to make meringue all the time for family dinners or when I had friends coming over. I would love baking pavlovas or whipping up a quick Eton mess if the meringue went wrong, which was usually the case! I really love to pipe my meringue, they look delicate and pretty and I love the appearance. If you’re going for a more rustic look you can place dollops on the baking sheet. I love my meringue crunchy and crisp on the outside and soft and marshmallowy in the centre. This recipe makes sure you get both those qualities! Once you’ve mastered making your own meringue, then you can let your imagination run wild. They’re delicious eaten just as they are or with berries and cream, but I do also love sandwiching the meringue together with Nutella, you could even drizzle over chocolate for extra decadence. To make perfect meringue, I have listed lots of helpful tips below for successful baking. Use room temperature eggs. If you store you eggs in the refrigerator, make sure you leave the separated egg whites in a bowl and leave them to stand at room temperature for at least 30 minutes prior to making the meringue. It is easier to separate cold eggs. Make sure your mixing bowl and whisk are completely clean and free of any grease. I wipe a slice of lemon around my mixing bowl and the whisk to clean. If your bowl and utensils contain grease, this may prevent the egg whites from whisking properly and reaching full volume. Always use superfine sugar – such as caster sugar. Add the sugar gradually to the whisked egg whites. Approx. 1 dessertspoon at a time. Adding the sugar slowly will enable it to incorporate better and give you a smoother and non grainy meringue. But don’t add the sugar too slowly as you may risk over beating the mixture. Always line your baking sheets/trays with non-stick paper. This will stop the meringue from sticking to the baking sheet. If the edges of the paper won’t stick, glue them down with a little meringue. It’s optional to add 1/4 teaspoon of cream of tartar in this recipe. I highly recommend it, as the cream of tartar will help stabilize the meringue and encourage it to hold its shape and peaks when piped. It also gives the meringue that amazing marshmallowy inside. In conventional ovens it is best to bake the meringue as near to the bottom of the oven as you can. For fan assisted you can bake on any shelf. Leave the meringue in the oven after the baking time, this enables the meringue to dry out. I leave mine in the oven overnight for best results. Preheat oven to 120°C. Line 1-2 baking sheets with non-stick paper or silicone mats and set aside. Place the room temperature egg whites along with the cream of tartar or salt in a large mixing bowl. Whisk until soft peaks form. With the mixer on medium speed, add the sugar a dessertspoon at a time, sprinkle into the egg whites. Once you’ve gradually added all the sugar, continue whisking for another 2-3 minutes or until the meringue is thick and glossy, and holds stiff peaks. This make take longer, depending on your mixer. Fill a large disposable piping bag fitted with your favourite piping nozzle. Pipe a small amount of the meringue onto the underside of each corner of the baking sheet – this will hold the paper down, so it doesn’t touch the meringue whilst it cooks. If you’re using silicone mats, like I did you will not need to do this. Pipe swirls of the meringue onto the baking sheets, make sure they are spread apart a little. You can also take 2 tablespoons of the meringue and place dollops on the baking sheet. This recipe made approx. 25-30 meringues. Reduce the oven temperature to 90°C. Place the trays of meringue as close to the bottom of your oven. Bake for 1 and 1/2 hours or until the meringues are crisp and when the bottom is tapped, it sounds hollow – don’t hesitate to put the meringue back into the oven until it sounds hollow, all ovens are different so cooking time may differ slightly. Once they’re ready, turn the oven off and leave the meringues in the oven to cool with the door closed for at least 3-4 hours or overnight. Once the meringues are cool, store in an airtight container for up to 2-3 weeks. These meringues indeed look perfect. Beautifully crafted and presented meringues, Jess! These meringues look absolutely gorgeous, Jess! I’ve never attempted to make my own before, so I’m loving this. Looks pefect! Thanks Gayle! You should definitely make your own meringue, so easy to make and delicious too! I love meringue, especially with some strawberries and choc shot on it, but I have never made them myself before. Wow, your meringues look absolutely perfect, Jess! Thank you so much for these tips…I’ve never tried my hand at meringues, but now I really want to go downstairs and give them a shot. Great job! These look gorgeous Jess! Thanks for the simple recipe and tips! Pinned! Wow! These look absolutely beautiful!! Thank you for the tips – I’ll have to try these soon. Such beautiful meringues!!! love this! I still don’t have them mastered! these are perfection! Thanks so much Cheyanne – your comment has made my day! You’re the sweetest! 😀 I’m so happy you like them! These are gorgeous! I’ve never made meringues, but now I want to try. I love the meringue + Nutella combo idea. YUM! Wow, these are gorgeous Jess! I’ve never made meringues because I’d always assumed they’d be too finicky. But now I have your tips! And I’m kind of obsessed with your nutella sandwich idea- yum!! Thanks so much Maya! 😀 The Nutella meringue sandwich is so good! I adore meringues, these really do look perfect! These are so fun! I bet they just melt in your mouth :). I’d love to try as a Sunday afternoon activity! These look exactly like the ones my grandma makes, pure perfection, a classic that I love, and your placement with roses is beautiful. Pinning! I love meringues, they literally melt in your mouth! These tips are wonderful and definitely helpful. These look great, Jess! I love meringues! Yours look absolutely gorgeous and perfect, Jess! Thanks Samina! 😀 Glad you like the tips and recipe! Meringues have been on my bucket list for FOREVER!! Yours are so cute and perfect! Your meringues look absolutely perfect! Love all your tips. I haven’t made meringue in ages and they will come in handy next time I make them! These meringue look awesome! I love the perfect swirls on it. I’ve made some coffee meringue in the past and it was so delicious. I’ll be trying this with a swirl of color. Well your not falsely advertising, that’s for sure – these are in fact PERFECT! so utterly perfect 🙂 These are mini works of art. Oh my gosh, Jess! These meringues look totally and completely perfect! I mean, the name says it all extreeeemly accurately. 😉 Crushing on those perfectly-peaked tops and I could definitely see myself not being able to stop eating these! Beautiful! So fun to try all sorts of different piping skills. I love these meringues! They look like pretty little clouds! I absolutely love meringues, and these look just perfect! They look so pretty piped out, don’t they? These DO look perfect!! So perfectly piped AND perfectly baked! Yum… Meringues are the best! Trying this recipe today. They look PERFECT so far! I sure hope they come out as great as they look. I’m excited to use your recipe and instructions to surprise my daughter with meringues on her birthday cake. Might you have any tips on coloring the meringue? I know food coloring can alter consistencies of some recipes. Hi Tiffiny, I’m really pleased you’re going to make this meringue recipe. I’m not entirely sure about adding food colouring to meringues, but I’ve seen it done before and I don’t believe it should alter the consistency too much. I’ve just looked up some tips for colouring meringue and several recipes say to turn a piping bag inside out and paint stripes of gel food colouring onto the bag. Add the meringue to the bag and when piped the meringue should have colourful swirls. I hope that answers your question – I’d love to know how you get on with the recipe!